From self-published Archway author to Simon and Schuster: Virginia Castleman shares how it happened. One of the great things about the Indie revolution is the only path to traditional publishing used to be work through an agent and have the book acquired. That has obviously changed as evidenced by this video. Virginia Castleman had a manuscript that bounced around among agents and publishing houses for years. Publishers were interested, but then they left the imprint and so she had to start over. Finally, she decided to self-publish her book Strays with Archway Publishing and that’s how Simon and Schuster found her. Her book was acquired by Aladdin books and slated for release next year. Listen to what Virginia has to say about her experience. You can find just about everything you need to know at the Author Learning Center. It hasn’t been around as some of the other resources aspiring authors can turn to to improve their craft and learn the business, but if you haven’t looked at the Author Learning Center, recently, you should. Quietly, the Author Learning Center has been amassing the most amazing collection of educational information for writers and authors to help navigate the new world of publishing. Writing, Publishing and Marketing, Oh My! On this site, you can find a wide variety of authors, agents and professional service providers sharing their insights, opinions, and expertise on writing, publishing and marketing books. Even better, most of this content is available in video, article and podcast formats. Plus, there is a regular schedule of helpful webinars available. How Do You Build a Social Media Platform From Scratch? How Do You Grab A Reader’s Attention? In addition to the great content, the Author Learning Center offers a Book Launch Tool and Author Circle tool to help aspiring authors create a plan and accountability on their publishing journey. It is a subscription model and it is managed by Author Solutions, who sponsors this blog, but if you subscribe for the year and eventually publish with an ASI imprint in a year, you will get your money back in a discount on your publishing package. Decide when is the best time for you to write and make that your routine. I have talked to hundreds of authors and the ones who get to the goal have a discipline about their writing. Most have a better time in the day when they write most productively. What is your best time to write? Do you know when it is? Have you marked out that time on your calendar everyday or most everyday. Make yourself accountable to help you stay on track. No secret here. Most goals are reached because we have others who help us get there. Find someone to provide encouragement as you write. This could be a friend, a relative or maybe a member of a local or online writers’ group. The Author Learning Center has tools and an online Author Circle that can help. 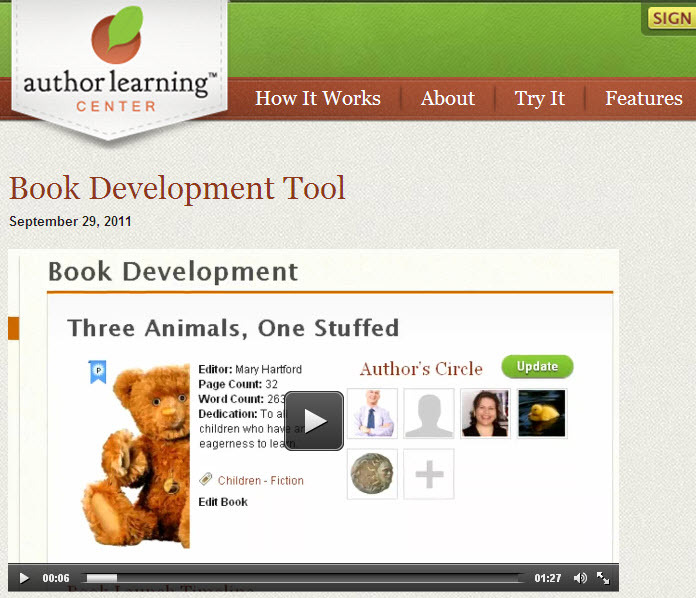 The ALC has tools and an online Author Circle to help you get to your publishing goal. Select the best publishing path based on your goals, budget and time and talent you have to invest. The Four Paths to Publishing whitepaper can help you understand and evaluate your options. You can download a free copy here. Plan your book launch event. Just like setting a deadline for holding your book, you want to set a date for a book launch party. Becoming a published author is quite an accomplishment and it is cause for celebration. Be creative. Think about holding it somewhere other an book store. Sell copies of your book and ask those who buy them to go online and write reviews. It will help you build your platform and get word of mouth started. What are your publishing plans for 2013? Do you have a book you plan to get into the hands of readers this year? Leave a comment with your plans and let me know when you publish your book. I will use this blog to help announce your accomplishment.